Recently I learned of two separate but related initiatives that are keeping Joe’s musical legacy alive, especially among young people. About four weeks ago I happened upon a web page describing an album, Our Tribute To Joe Zawinul, performed by the faculty and students of The Joe Zawinul Music School in Gumpoldskirchen, Austria, located about 30 kilometers southwest of Vienna. Music is one of the few forms of communication that enable interpersonal communication and understanding between people without language barriers and intellectual boundaries. Especially in this day and time, especially for young people, it is particularly important to promote and maintain the choice of musical and its creative potential. The music school at Gumpoldskirchen is doing something significant. In collaboration with a far-sighted council, the school established Austria’s first department for popular music with comprehensive training and outstanding, internationally renowned teachers. Since it’s launch in 1988, the school has constantly improved and expanded. I therefore happily comply to the renaming of the school “Joe Zawinul Music School” and hope that it will serve many young people as a musical training facility. 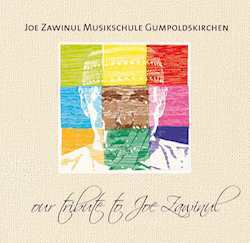 The Joe Zawinul Musikschule Gumpoldskirchen, the only music school worldwide allowed to feature the artist’s name, is aware of the responsibility resulting from that distinction. Since the foundation of the first Austrian Department of Popular Music at our school in 1988, and the naming in 2003, we are always ready to mediate music in the sense of our mentor. We, the teachers and students, which to take the 80th birthday of our friend and sponsor, Joe Zawinul, on July 7th, 2012 as an occasion to respectfully honor his artistic heritage by the creation and publication of a CD, containing a selection of his compositions in new arrangements and instrumentations. With our work, we hope to contribute to the celebration of one of the most impressive musicians of the 20th century’s artistic legacy in a respectful way, and simultaneously we would like to show that the compositions of Joe Zawinul are able to impress children and teens as well as music students. You can listen to excerpts from the album here. It is available for purchase here. It’s good to see Joe’s legacy carried forward with young people, which brings me to the Zawinul Foundation For Achievement. The foundation is spearheaded by Joe’s eldest son, Anthony. It’s mission is to “[encourage] and cultivate the pursuit of a dream to perform in the fields of Art, Education and Sports through the creation, identification and support of grants, awards, scholarship, internships, and commission opportunities.” There are several initiatives already underway. The first is the installation of a display of Joe’s personal belongings, including some of his keyboards and other memorabilia from his career, in the entrance hall of the Zawinul Music School. It is the initial step toward an eventual Zawinul museum and cafe. The installation coincided with the inaugural Zawinul Awards at the school. Four students were nominated for the first Z Award, and the winner, vocalist Katharina Wollmann, was announced at a ceremony held at the school on May 26. The foundation has also announced the 2014 Joe Zawinul International Music Program. The program will be held at the Zawinul Music School June 15-30, 2014, encompassing private instruction, ensemble performances and culminating with a live performance at the prestigious Open Air Donauinsel Festival on the banks of the Danube River. In addition, scholarships will be awarded to cover student expenses. Further information can be found here. These are noteworthy developments in the preservation of Joe’s legacy and his music, and I wish the foundation and the school well. This entry was posted on Saturday, June 1st, 2013 at 1:19 pm and is filed under News. You can follow any responses to this entry through the RSS 2.0 feed. You can leave a response, or trackback from your own site.